Both the Glencairn & Moniaive and Dunscore Congregations had Mission Partners in the past, but these links ceased as personnel retired or moved to new postings abroad. Discussions took place in 2007 with the Church of Scotland’s World Mission Council, who advised on the experience of other Scottish churches in twinning with other congregations and on the best practice guidelines for twinning. 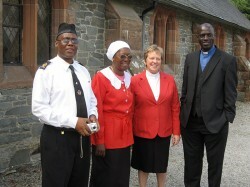 We were introduced to Rev Simon Kasanga who was visiting Scotland. As a result of discussions with our Minister, Revd Christine Sime, plans evolved to ‘twin’ our congregations with his United Church of Zambia Congregation in Lubuto, Ndola, Zambia. There was the prospect of personal and spiritual growth and the making of lasting friendships through this twinning. 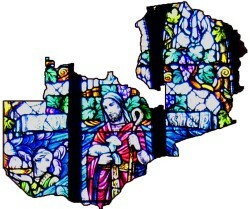 The first real contact was by a group that travelled from the Cairn Valley to Zambia in September 2007. Following that visit, and an eagerness to bring a closer arrangement, we worked with our Zambian partners to create a twinning agreement. This was formalised at a signing ceremony in Lubuto in April 2008, attended by some of our members. • To enrich and support each other through learning from and sharing in our faith and trust in Jesus. • To give us all opportunities to put into practice Our Lord’s command “To Love Our Neighbour”. • To build on friendships made during the visits to Scotland and to Lubuto. • To learn about each other’s lands, daily lives and cultures and to develop an understanding of how our actions affect those in other countries. Five visitors from Lubuto came to the Cairn Valley in September 2008 and spent almost three weeks with us. Our visitors joined in the regular church activities, visited the schools, had trips to other parts of Scotland, took part in our Twinning Ceremony, shopped in Dumfries, and entertained us with their dancing and singing. Many volunteers from both congregations willingly supported the whole operation. These included home hosts, mealtime hosts, hosts for outings, and for transportation. Members from both churches had the opportunity to meet and work together, some meeting for the first time. Undoubtedly, all who met the visitors were impressed and humbled by what they had to tell us about the difficulties of everyday life in Zambia, their hopes, their Faith, their appreciation of our alliance, and in the way they expressed all of this to us. As a result of fundraising in our two parishes during 2008, as well as in Lubuto, our partners were able to progress the building of classrooms in the church compound. By the next autumn they had been able to install electricity in the school, and to progress with finishing touches. A relatively small amount of money raised here goes amazingly far in Zambia, and lets them achieve much for their community. In Autumn 2009, our parishes and members hosted a visit from the Lubuto Congregation’s new minister, the Rev Stephen Simumba. Autumn 2010 saw another group of Zambian visitors in our midst. The main theme of the visit was to learn about the education system and provision in this area. We heard from our Visitors the difficulties that they have had in effectively funding their school project. The proper equipping and expansion of the pre-school group is seen as important. They have learned and taken away some new ideas on sustainable management of the school overall. Several outings were organised to show our visitors some more of the area beyond the Cairn Valley. We had the opportunity to exchange views on the development of the Twinning and to outline the possibility of future exchanges. In the meantime, the Twinning partners try to keep in touch with each other’s news and developments by email. Our friends in Lubuto have recently had another change in Minister. Since 2018 their pastoral care has been led by Revd Simukonda, and we hope to develop contact with him in the coming months. Plans are being finalised for two of the members from our linked Congregation in Dunscore to visit our twinned Church at Lubuto in Zambia, sometime nearer Easter 2019. Their trip is being supported by the Faithshare Visitor Programme to strengthen our twinning.